The mantle is a particular type of layer within an astronomical body. A mantle in most instances occurs in a solid object as the layer of material surrounding a definable, extra-dense core. The mantle, itself may be divided into two sub-layers and may be overlain by a layer called the "crust," as is the case with the planet Earth. 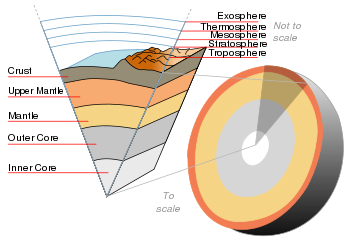 In Earth's interior, the mantle is a rocky layer directly beneath the crust and above the outer core. The mantle makes up about 70 percent of Earth's volume and overlies the Earth's iron-rich core, which occupies about 30 percent of Earth's volume. Although it is predominantly solid, much of the mantle is highly viscous because of extremely high pressures within it. Convection of the mantle is expressed at the surface through the motions of tectonic plates. Past episodes of melting and volcanism at the shallower levels of the mantle have produced a very thin crust of crystallized melt products near the surface, upon which we live. The gases evolved during the melting of Earth's mantle have a large effect on the composition and abundance of Earth's atmosphere. Information about the structure and composition of the mantle result either from geophysical investigation or from direct geoscientific analyses of mantle-derived xenoliths. the D" layer (2798–2998 km). The top of the mantle is defined by a sudden increase in seismic velocity, which was first noted by Andrija Mohorovičić in 1909. This boundary is now referred to as the "Moho". The uppermost mantle plus overlying crust are relatively rigid and form the lithosphere, an irregular layer with a maximum thickness of perhaps 200 km. Below the lithosphere the upper mantle becomes notably more plastic in its rheology. In some regions below the lithosphere, the seismic velocity is reduced; this – so-called – low velocity zone (LVZ) extends down to a depth of several hundred km. Inge Lehmann discovered a seismic discontinuity at about 220 km depth; although this discontinuity has been found in other studies it is not known whether the discontinuity is ubiquitous. The transition zone is an area of great complexity; it physically separates the upper and lower mantle. Very little is known about the lower mantle apart from that it appears to be relatively seismically homogeneous. D" is the layer which separates the mantle from the core. The mantle differs substantially from the crust in its mechanical characteristics and its chemical composition. The distinction between crust and mantle is based on chemistry, rock types, rheology and seismic characteristics. The crust is, in fact, a product of mantle melting. Partial melting of mantle material is believed to cause incompatible elements to separate from the mantle rock, with less dense material floating upward through pore spaces, cracks, or fissures, to cool and freeze at the surface. Typical mantle rocks have a higher magnesium to iron ratio, and a smaller portion of silicon and aluminum than the crust. This behavior is also predicted by experiments that partly melt rocks thought to be representative of Earth's mantle. Mantle rock shallower than about 400 km depth consists mostly of olivine, pyroxenes, spinel, and garnet; typical rock types are thought to be peridotite, dunite (olivine-rich peridotite), and eclogite. Between about 400 km and 650 km depth, olivine is not stable and is replaced by high pressure polymorphs with approximately the same composition: one polymorph is wadsleyite (also called beta-spinel type), and the other is ringwoodite (a mineral with the gamma-spinel structure). Below about 650 km, all of the minerals of the upper mantle begin to become unstable. The most abundant minerals present have structures (but not compositions) like that of the mineral perovskite followed by the magnesium/iron oxide ferropericlase. The changes in mineralogy at about 400 and 650 km yield distinctive signatures in seismic records of the Earth's interior, and like the moho, are readily detected using seismic waves. These changes in mineralogy may influence mantle convection, as they result in density changes and they may absorb or release latent heat as well as depress or elevate the depth of the polymorphic phase transitions for regions of different temperatures. The changes in mineralogy with depth have been investigated by laboratory experiments that duplicate high mantle pressures, such as those using the diamond anvil. Why is the inner core solid, the outer core liquid, and the mantle solid/plastic? The answer depends both on the relative melting points of the different layers (nickel-iron core, silicate crust and mantle) and on the increase in temperature and pressure as one moves deeper into the Earth. At the surface both nickel-iron alloys and silicates are sufficiently cool to be solid. In the upper mantle, the silicates are generally solid (localized regions with small amounts of melt exist); however, as the upper mantle is both hot and under relatively little pressure, the rock in the upper mantle has a relatively low viscosity. In contrast, the lower mantle is under tremendous pressure and therefore has a higher viscosity than the upper mantle. The metallic nickel-iron outer core is liquid despite the enormous pressure as it has a melting point that is lower than the mantle silicates. The inner core is solid due to the overwhelming pressure found at the center of the planet. In the mantle, temperatures range between 500 °C to 900 °C (932 °F–1,652 °F) at the upper boundary with the crust to over 4000 °C (7200 °F) at the boundary with the core. Although the higher temperatures far exceed the melting points of the mantle rocks at the surface (about 1200 °C for representative peridotite), the mantle is almost exclusively solid. The enormous lithostatic pressure exerted on the mantle prevents melting, because the temperature at which melting begins (the solidus) increases with pressure. Due to the temperature difference between the Earth's surface and outer core, and the ability of the crystalline rocks at high pressure and temperature to undergo slow, creeping, viscous-like deformation over millions of years, there is a convective material circulation in the mantle. Hot material ascends as a plutonic diapir (somewhat akin to a lava lamp), perhaps from the border with the outer core (see mantle plume), while cooler (and heavier) material sinks downward. This is often in the form of large-scale lithospheric downwellings at plate boundaries called subduction zones . During the ascent the material of the mantle cools down both adiabatically and by conduction into surrounding cooler mantle. The temperature of the material falls with the pressure relief connected with the ascent, and its heat distributes itself over a larger volume. Because the temperature at which melting initiates decreases more rapidly with height than does a rising hot plume, partial melting may occur just beneath the lithosphere and causing volcanism and plutonism. Although there is a tendency to larger viscosity at greater depth, this relation is far from linear, and shows layers with dramatically decreased viscosity, in particular in the upper mantle and at the boundary with the core. The mantle within about 200 km above the core-mantle boundary appears to have distinctly different seismic properties than the mantle at slightly shallower depths; this unusual mantle region just above the core is called D″ ("D double-prime" or "D prime prime"), a nomenclature introduced over 50 years ago by the geophysicist Keith Bullen. D″ may consist of material from subducted slabs that descended and came to rest at the core-mantle boundary and/or from a new mineral polymorph discovered in perovskite called post-perovskite. Due to the relatively low viscosity in the upper mantle one could reason that there should be no earthquakes below approximately 300 km depth. However, in subduction zones, the geothermal gradient can be lowered where cool material from the surface sinks downward, increasing the strength of the surrounding mantle, and allowing earthquakes to occur down to a depth of 400 km and 670 km. The pressure at the bottom of the mantle is ~136 GPa (1.4 million atm). There exists increasing pressure as one travels deeper into the mantle, since the material beneath has to support the weight of all the material above it. The entire mantle, however, is still thought to deform like a fluid on long timescales, with permanent plastic deformation accommodated by the movement of point, line, and/or planar defects through the solid crystals comprising the mantle. Estimates for the viscosity of the upper mantle range between 1019 and 1024 Pa•s, depending on depth, temperature, composition, state of stress, and numerous other factors. Thus, the upper mantle can only flow very slowly. However, when large forces are applied to the uppermost mantle it can become weaker, and this effect is thought to be important in allowing the formation of tectonic plate boundaries. The first attempt at mantle exploration, known as Project Mohole, was abandoned in 1966 after repeated failures and cost over-runs. The deepest penetration was approximately 180 m (590 ft). In 2005 the third-deepest oceanic borehole hole reached 1416 meters (4,644 feet) below the sea floor from the ocean drilling vessel JOIDES Resolution. On March 5, 2007, a team of scientists on board the RRS James Cook embarked on a voyage to an area of the Atlantic seafloor where the mantle lies exposed without any crust covering, mid-way between the Cape Verde Islands and the Caribbean Sea. The exposed site lies approximately three kilometers beneath the ocean surface and covers thousands of square kilometers. A relatively difficult attempt to retrieve samples from the Earth's mantle was scheduled for later in 2007. As part of the Chikyu Hakken mission, was to use the Japanese vessel 'Chikyu' to drill up to 7000 m (23,000 ft) below the seabed. This is nearly three times as deep as preceding oceanic drillings. A novel method of exploring the uppermost hundreds km of the Earth was recently analyzed, consisting of a small, dense, heat-generating probe which melts its way down through the crust and mantle while its position and progress are tracked by acoustic signals generated in the rocks. The probe consists of an outer sphere of tungsten ~ 1 m in diameter inside which is a 60Co radioactive heat source. It was calculated that such a probe will reach the oceanic Moho in less than 6 months and attain minimum depths of well over 100 km in a few decades beneath both oceanic and continental lithosphere. ↑ Andrew Alden, 2007. Six Things to Know About the Earth's Mantle. About.com. Retrieved November 15, 2008. ↑ 2.0 2.1 The structure of the Earth. Moorland School. Retrieved November 15, 2008. ↑ 3.0 3.1 3.2 3.3 3.4 Andrew Alden, 2007. Today's Mantle: a guided tour. About.com. Retrieved November 15, 2008. ↑ Earth cutaway (image). Think Quest. Retrieved November 15, 2008. ↑ 5.0 5.1 5.2 5.3 5.4 Roger George Burns, 1993. Mineralogical Applications of Crystal Field Theory. (Cambridge, UK: Cambridge University Press. ISBN 0521430771), 354. Retrieved November 15, 2008. ↑ Istria on the Internet – Prominent Istrians – Andrija Mohorovicic. Istrianet.org. Retrieved November 15, 2008. ↑ Michael Carlowicz, 2005. Inge Lehmann biography. American Geophysical Union, Washington, DC. Retrieved November 15, 2008. ↑ Earth's Internal Structure – Crust Mantle Core. Geology.com. Retrieved November 15, 2008. ↑ Geoscience: the earth: structure… Australian Museum. Retrieved November 15, 2008. ↑ I. Kantor, L. Dubrovinsky, and C. McCammon. 2007. Pressure-induced spin crossover in ferropericlase: an alternative concept. Geophysical Research Abstracts 9:06070. Retrieved November 15, 2008. ↑ Andrew Alden, The Big Squeeze: Into the Mantle. About.com. Retrieved November 15, 2008. ↑ Mantle. Everything2.com. Retrieved November 15, 2008. ↑ 13.0 13.1 13.2 J. Louie, 1996. Earth's Interior. University of Nevada, Reno. Retrieved November 15, 2008. ↑ 14.0 14.1 Mantle Viscosity and the Thickness of the Convective Downwellings. igw.uni-jena.de. Retrieved November 15, 2008. ↑ Andrew Alden, The End of D-Double-Prime Time? About.com. Retrieved November 15, 2008. ↑ Ker Than, 2007. Scientists to study gash on Atlantic seafloor. Msnbc.com. Retrieved November 15, 2008. "A team of scientists will embark on a voyage next week to study an “open wound” on the Atlantic seafloor where the Earth’s deep interior lies exposed without any crust covering." ↑ Earth's Crust Missing In Mid-Atlantic. Science Daily. Retrieved November 15, 2008. "Cardiff University scientists will shortly set sail (March 5) to investigate a startling discovery in the depths of the Atlantic." ↑ Japan hopes to predict 'Big One' with journey to center of Earth. PhysOrg.com. Retrieved November 15, 2008. "An ambitious Japanese-led project to dig deeper into the Earth's surface than ever before will be a breakthrough in detecting earthquakes including Tokyo's dreaded "Big One," officials said Thursday." ↑ M.I. Ojovan, F.G.F. Gibb, P.P. Poluektov, and E.P. Emets. 2005. Probing of the interior layers of the Earth with self-sinking capsules. Atomic Energy 99:556–562. Burns, Roger George. 1993. Mineralogical Applications of Crystal Field Theory. Cambridge, UK: Cambridge University Press. ISBN 0521430771. Ojovan, M.I., and F.G.F. Gibb. "Exploring the Earth’s Crust and Mantle Using Self-Descending, Radiation-Heated, Probes and Acoustic Emission Monitoring." Chapter 7, in Arnold P. Lattefer, 2008. Nuclear Waste Research: Siting, Technology and Treatment. New York, NY: Nova Science Publishers. ISBN 9781604561845. This page was last modified on 10 August 2018, at 18:37.